What Are the Best Ways to Use Chlorella? Every day we come in contact with heavy metals and other toxins. While we all try our best to avoid them, we can’t always keep our lives toxin free. One of the biggest reasons people choose to take chlorella daily is because chlorella helps support your body’s normal detoxification process. Toxins are unavoidable even for those following the cleanest of diets. Regularly taking chlorella can also help support your body’s overall health! Another increasingly popular reason people take chlorella is for skin care. Taking it as a daily supplement is a great way to increase the health of your body and skin, but did you know there are also chlorella based skin care products? That’s right, now you can put chlorella directly onto your skin and watch the magic happen! Your skin takes a constant beating trying to provide a barrier that keeps the elements of the world from entering your body and causing infection or other problems. It’s important that you work hard to keep your skin as healthy as it keeps you. Using chlorella in skin creams and other skin care products provides your skin with the nutrition it needs directly at the source. 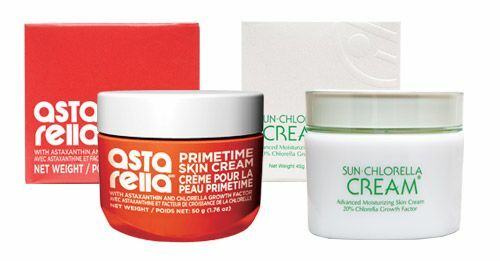 Sun Chlorella’s skin care products work hard to support your skin’s health. Not only does it provide your skin with antioxidants, but it also supports cellular growth and repair, nourishes the skin with vitamins and minerals, and are paraben and propylene glycol free. The most popular way to take chlorella is as a daily supplement. Sun Chlorella offers chlorella in several different forms, including tablets, powder, and granules. Sun Chlorella’s chlorella supplements are unlike any others on the market. They make sure to only use the cleanest and highest quality chlorella species, Chlorella pyrenoidosa. Chlorella is a single celled fresh water green algae, that contains nutrients, vitamins, and minerals, all contained within the thick cell wall. Because our bodies have difficulty digesting or breaking down the cell wall, Sun Chlorella pioneered the use of an advanced system to pulverize the cell wall to make maximum nutrients available to you. This makes Sun Chlorella the most digestible chlorella brand on the market! Those who take chlorella on a daily basis have access to an incredible nutritional supplement. Chlorella is high in Vitamin D, B12 and Iron. Chlorella also contains nucleic acids, chlorophyll, and more. There are a lot of different reasons why people choose to take chlorella. It has a lot of uses that can benefit several different areas of your health and help you live a healthy lifestyle. If you’re unsure of what way you’d like to take chlorella, contact us. We’d be more than happy to help you find what way you’d like to use chlorella. What way will you try? Marisela Corrado is a health enthusiast. When she's not reading or writing, she enjoys hiking, and playing with her daughter and two fur babies Fred and Sasha.